Versatility! 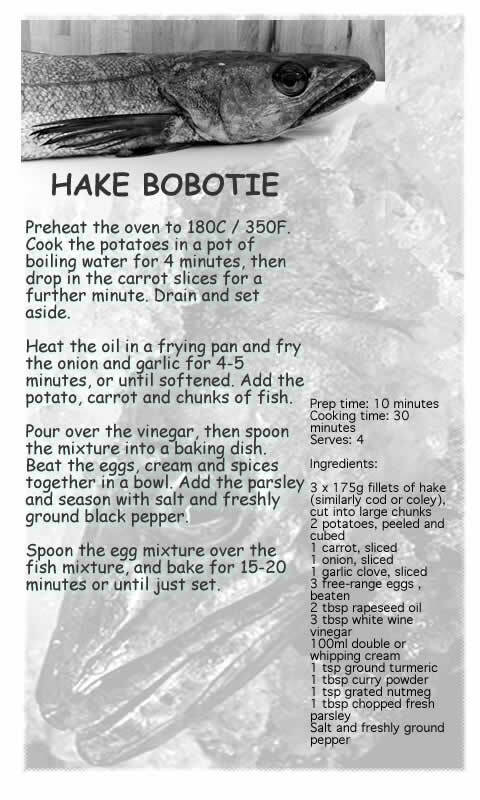 That's hake's middle name. Braise, griddle, BBQ, poach, steam, bake and grill, the hake can take it all. Best of all, there are very few bones so fillets and steaks are great for kids and those who find picking meat from bones a tedious task. The first recipe comes straight from the pages of Rick Stein's new book, Spain. Galician hake - Merluza a la gallega - Rick Stein's 'Spain' - BBC books. Galician hake on a braise of potatoes, garlic, tomato and onion. 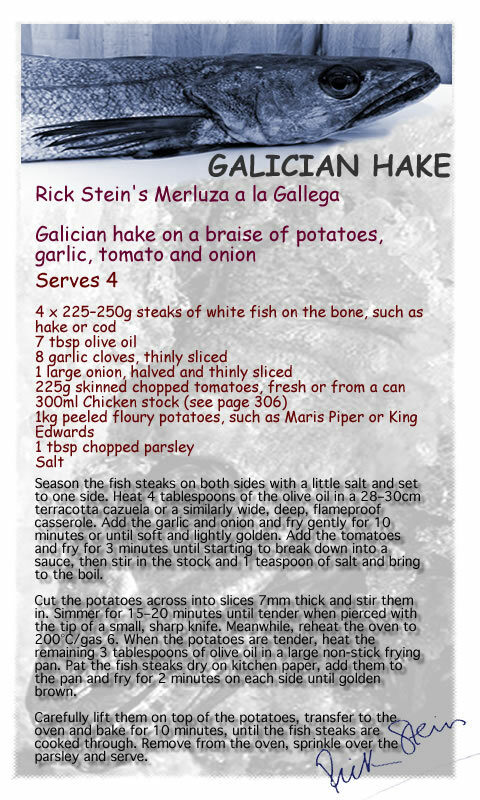 There is a homely wholesomeness about Galician food, and this is the sort of dish you could imagine also coming from some region of the British Isles, like west Wales, if only we loved hake like the Spanish do. Interestingly, when Debbie and I cooked this for our recipe testing in a blistered and cracked terracotta cazuela and gave it to our deli to sell, it was all gone in about 20 minutes. What I love about this is the thickness and whiteness of a good piece of white fish and the aroma of the garlic and tomato coming from the potato fondue below. 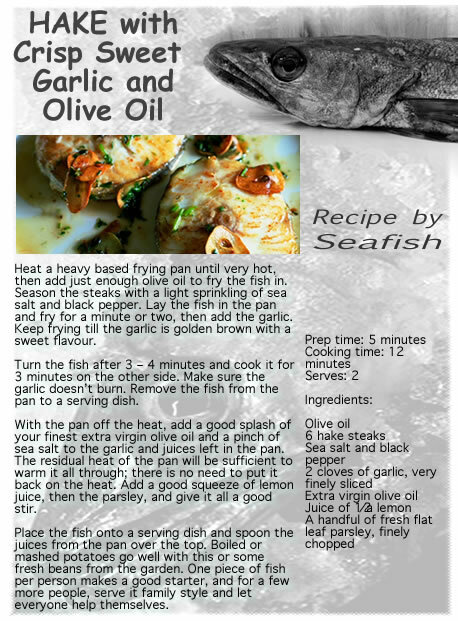 Like many of these sorts of dishes, I believe in completely cooking the vegetables first on top of the stove, and then baking the fish on top in the oven. 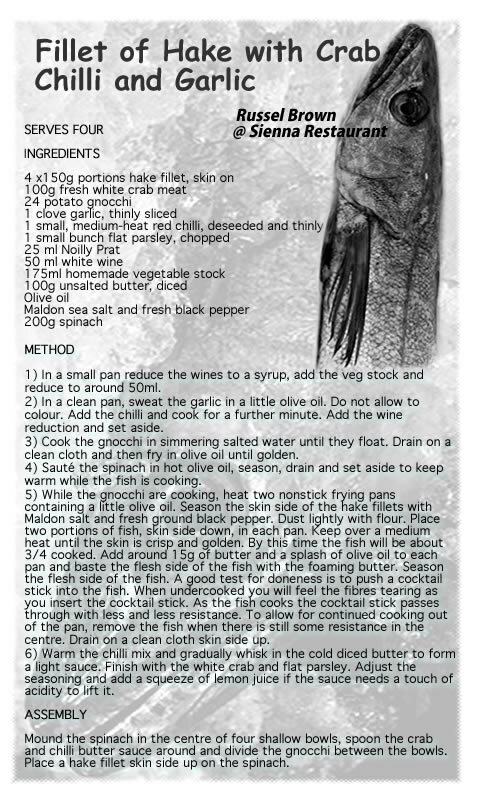 If you don’t do this it can end up a bit watery, but this way its flavour is much more rich and concentrated. Fillet of Hake with Crab Chilli and Garlic from Russel Brown's Sienna Restaurant, Dorset.